If I can have one word to describe the Re(marc)able Full Conver Concealer it is... Remarkable! Whatever you hope for from a concealer can be found in this tiny jar. It conceals skin imperfections flawlessly. It is hydrating. It blends with my foundation and don't look cakey throughout the day. What more can I ask for? I do admit that the price is pretty steep compared to other good concealers in the market, but the quality is worth paying for. It is infused with soy protein, shea butter, and coconut extract to help repair, moisturize, and rejuvenate your skin. It has a creamy texture and very smooth when glides onto the skin. Be warned that this concealer is soft and buttery, if you are applying on oily skin, this product may require setting with powder. It has medium coverage and buildable to full coverage with two layer of application. It does cover dark eye circles, acne scars and dark spots effectively. Normally, I use my fingers to apply my concealers. It is the same for this case. However, for hygiene purposes, I always recommend you to apply with a concealer brush. Besides the good function of the product, I also adore its packaging. It is sleek and has a wide opening which is easy to apply if you're using a finger. Some concealer has a small opening which caused the products get trapped under your fingernails whenever you dig into the jar. This may not concern much unless you're applying with your finger and has long nails. So far this is the best concealer that I've ever tried. It has a similar texture to Canmake's Eyeshadow Base. If you've use the eyeshadow base before, you'll know it is very smooth and silky. I can't emphasize enough on the texture, so I do recommend you to do some swatching of this concealer if you happen to pass by Sephora. This is a great concealer. I really can't think of any downside of the product except that the price is really expensive for the amount of product you get in the jar. 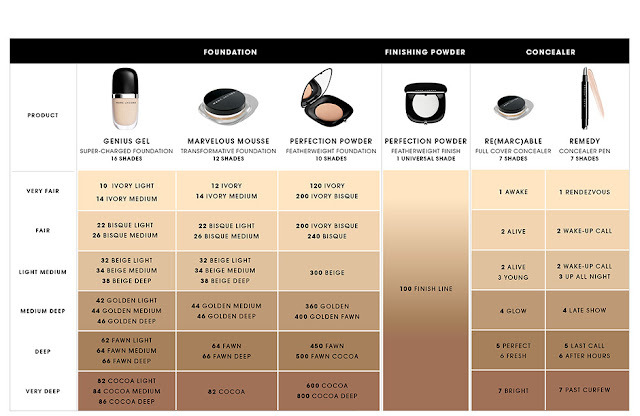 Also, the range of Marc Jacobs foundation, powder and concealer don't come with the same shade code/name. It is pretty hard to find a matching foundation or other coverage makeups. However, you can use the shade chart below for all the Marc Jacobs coverage products as a reference if you decide to purchase it online. Octyldodecanol, Polybutene, Phenylpropyldimethylsiloxysilicate, Polyglycerl-2 Tetroisostearate, Ethylene/Propylene Copolymer, Vp/Eicosene Copolymer, Synthetic Fluorphlogopite, Dicalcium Phosphate, Cetyl Peg/Ppg-I0/I Dimethicone, Polyglyceryl-4 Isostearate, Ozokerite, Caprylic/Capric Triglyceride, Silica, Hexyl Laurate, Stearalkonium Bentonite, Propylene Carbonate, Bht, Methicone, Ethyl Vanillin, Hydrogenated Coconut Oil, Carthamus Tinctorius (Sfflower) Seed Oil, Commiphora Myrrha Resin Extract, Tocopherol, Gardenia Tahitensis Flower, Tocopheryl Acetate, Carmine (Ci 75470). (+/-)</b> Titanium Dioxide (Ci 7789I), Iron Oxides (Ci 7749I, Ci 77492, Ci 77499), Red 6 (Ci I5850), Red 7 (Ci I5850), Red 7 Lake (Ci I5850), Blue I Lake (Ci 42090), Yellow 5 Lake (Ci I9I40) Yellow 6 Lake (Ci I5985).